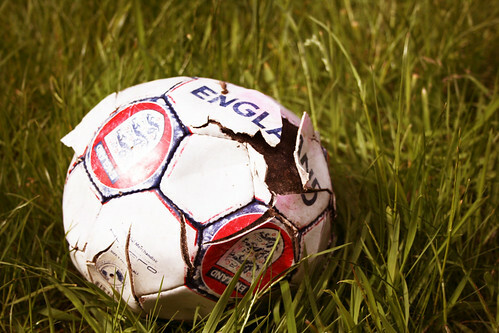 England’s World Cup victory is undeniably English football’s high point. Their solitary win – which could easily have been more had it not been for their arrogance in ignoring earlier competitions – showed they were the world’s best at a time where other countries had proven they were competitive, rather than the default best in the Anglo-dominated early days of the game. Nevertheless, there’s a case to be made for it being the worst thing to ever happen to English football. For one, it was a success that hasn’t been matched since, putting more and more pressure on each generation of players that followed. On top of that, it vindicated ideas that were still perhaps wrong: England were the best team at the tournament and deserved their victory despite suspect refereeing displays against Argentina and in the final, but they were not great and had taken advantage of tactical innovation for perhaps the only time in their history. What could have been a jumping off point for English football became what it aspired to be – Alf Ramsey and his 1966 squad withered away, failing to qualify for the 1974 World Cup, but the 4-4-2 remains entrenched as the default in English football, made worse by the narrowing influence of Charles Reep and his direct football dogma. It was only when the Premier League started importing some of Europe’s best coaches that significant progress was made in this regard. Still, what came after doesn’t detract from the fact Ramsey’s “wingless wonders” were innovative for the time. Ramsey had decided that the then-common 4-2-4 didn’t offer enough cover against better sides, meaning that superior sides could easily outmanoeuvre England’s midfield. He placed the blame on the wingers: “To have two players stuck out wide on the flanks is a luxury which can virtually leave a side with nine men when the game is going against them.” The back four popularised by Brazil had left wingers less effective in attack too, as the full-backs could stick close to them and remove the space for acceleration they needed – defences weren’t as stretched as they once were. England began playing in a lopsided 4-3-3, still fielding one winger but bringing the other wide player deeper. Ramsey continued to switch between the 4-2-4 and the lopsided 4-3-3, partly to ensure he was right about the weaknesses of the former and partly to cover up the strength of the latter, saying “I think it would be quite wrong to let the rest of the world, our rivals, see what we are doing”. It wasn’t until the final game before the World Cup, a 1-0 win over Poland, that we would first see the 4-4-2. This wasn’t the formation that would be popularised for decades in English football – something closer to a 4-4-2 diamond, as Bobby Charlton had been brought deeper into an attacking midfield role behind the strikers and Nobby Stiles played as an anchor-man, doing the dirty work deeper still – yet the general idea was there because of the deeper wide players. The lopsided 4-3-3 returned for the group games of the World Cup to moderate success, but Ramsey opted to introduce the 4-4-2 properly as the tournament headed into the latter stages. The game against Argentina devolved into a gruelling physical battle that England emerged victorious from, Stiles marking Ermindo Onega out of the game, but the game against Portugal was England’s most impressive performance of the tournament, with Stiles neutralising Eusebio’s influence this time. There was another change to be made heading into the knock-out stages: England’s most prolific striker and darling of the media Jimmy Greaves suffered a nasty gash on his leg, ruling him out until the final, so he was replaced by West Ham forward Geoff Hurst. Greaves was fit again for the final, leading to calls from the press for his return, but Hurst had impressed, scoring the only goal against Argentina, so he kept his spot. Hurst’s inclusion was part of a plan by Ramsey to use more well-rounded players – Greaves, like the wingers who had been replaced by Martin Peters and Alan Ball, was perhaps more talented than Hurst, but the latter had more to his game, able to hold the ball up as well as score goals. 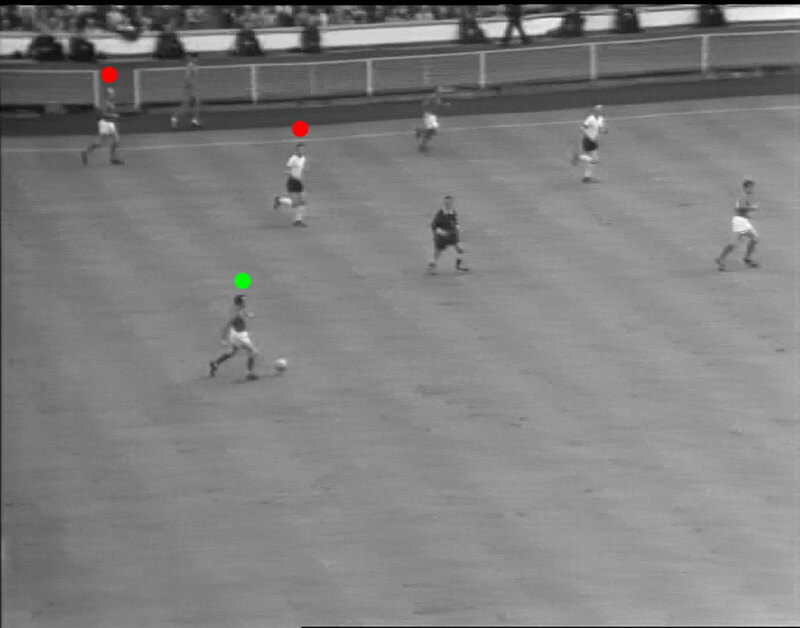 This could be seen from the off in the final as Hurst dropped a little deeper to the left of Roger Hunt to lay off long balls for the midfielders, engineering a wasted chance for West Ham teammate Peters with a little over a minute gone. The bigger attacking influence early on came from Stiles however. 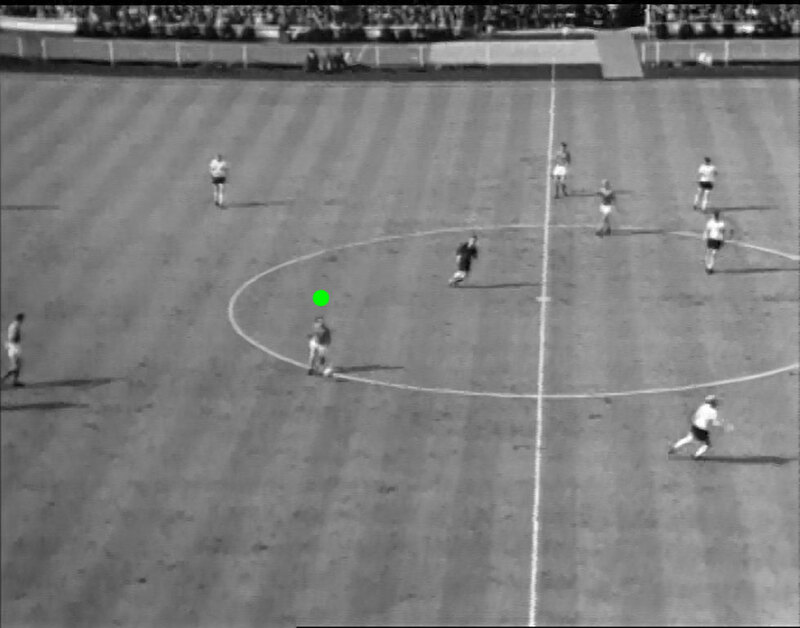 Perhaps the Germans were willing to let him have more of the ball than the three interchanging midfielders ahead of him because they knew he would do less with it – after all, it wasn’t particularly likely that Stiles would have been playing had Ramsey stuck with a 4-2-4: he didn’t have the creative ability of his other midfielders and it would have put too much pressure on his partner – but the German midfield of Franz Beckenbauer and Wolfgang Overath more than likely would have swarmed over the weaker Stiles had they not been busy dealing with his teammates. Someone who ultimately shouldn’t have been a threat was given the time and space to become one and many of the early chances involved his free passes. Nevertheless, it was the West Germans who took the lead when Ray Wilson’s poor clearing header fell to Helmut Haller to finish. The cross came from Siegfried Held’s preference for an inside forward role engineering him the room to swing in crosses from deeper, but otherwise West Germany struggled to get the ball forward. 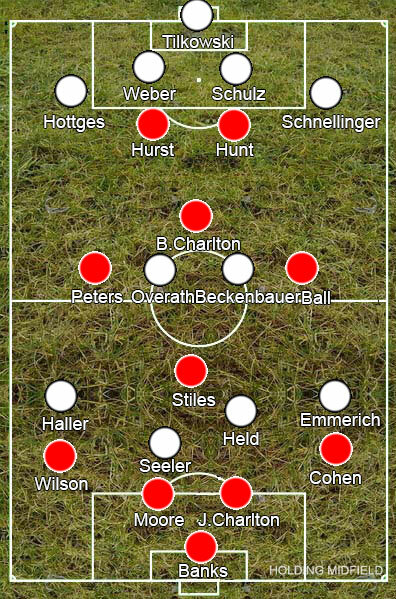 With more men added to the England midfield, Overath and Beckenbauer were outnumbered and forced into using long balls to link the defence and attack. 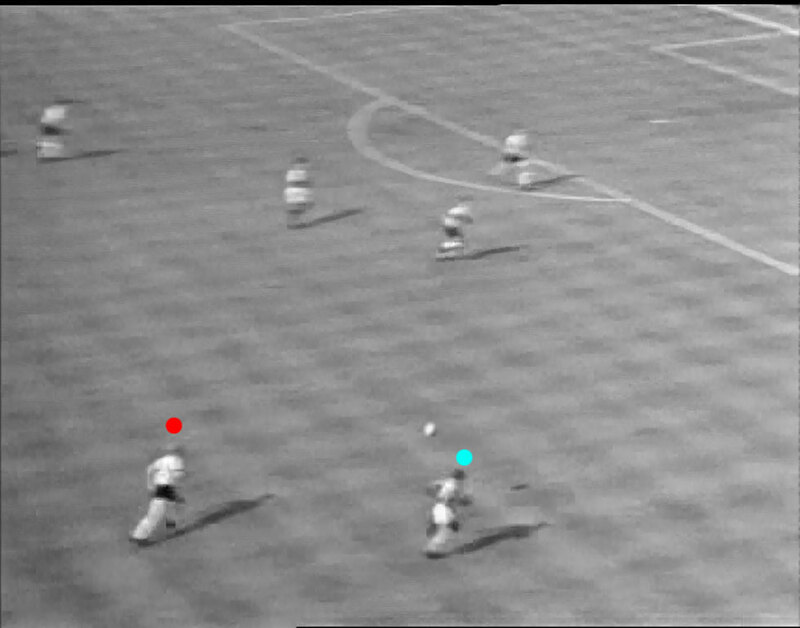 As well as making them more defensively strong, Ball and Peters coming into the centre also opened up space ahead of full-backs Ray Wilson and George Cohen, which they felt more comfortable charging forward into as the game went on. England’s goals may have come from set-pieces but they had dominated open play. As the minutes ticked away and the Germans flooded forward in search of a goal, it was still England who looked more likely to score. For all the outrage over what would become the winning goal, it’s overlooked that Wolfgang Weber’s last minute goal came from a free-kick that wouldn’t have been considered a foul at the time, gifting them a goal that, for all their talent, they hadn’t really deserved. As the game headed into extra time, tiredness began to set in, leaving the positioning of players much more static. Peters and Ball didn’t drift inside quite so much but England were still controlling the midfield, and its their most dubious goal that best shows what England did correctly. After another long ball forward from West Germany, the loose ball fell to Stiles, who was free to pick out a pass for Ball to run onto and swing in towards Hurst. That Ball was so easily able to escape Schnellinger showed the new problem posed by Ramsey’s repositioning of the wide players deeper. The switch to back fours had nullified many wingers as it had robbed them of the space needed to accelerate away from their marker, but positioning them deeper recreated this space: if the winger played deeper but the full-back didn’t follow, the wide midfielder could pick up the ball in space and use it to accelerate as they had done before. 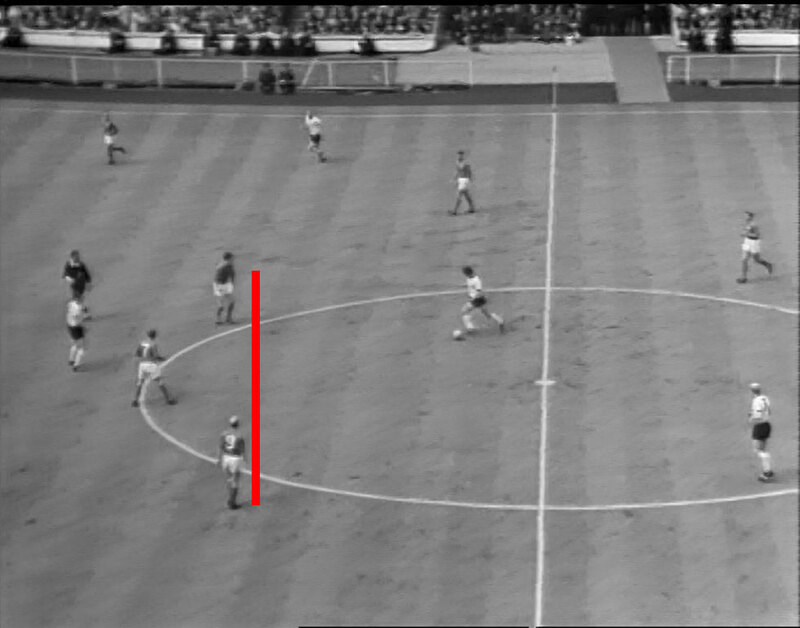 If the marker did follow, as Schnellinger had done, it left space behind the full-back to exploit. West Germany didn’t have a reply and this time it was England who got a late goal, making Hurst, a substitute going into the tournament, the only player to have scored a hat-trick in a World Cup final. As the years since England’s sole crowning moment grew larger, its success was bastardised. 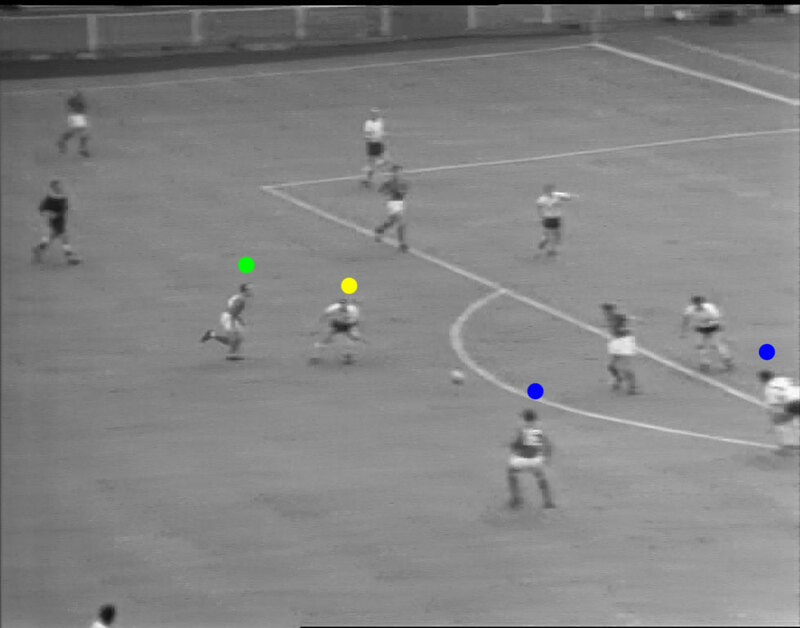 The revolutionary 4-4-2 and style of play that accompanied it had more in common with the 4-3-1-2 many Italian clubs use today than the mindless kick-and-rush that pervaded English football; the grit and hard work of Stiles, Ball and Peters was as much about astute tactical choices by Ramsey as it was about their desire to win; the benefits of packing the midfield is something England suffered from in their last tournament. It’s not uncommon to hear that today’s England stars have a lot to learn from the 1966 squad, but truthfully it was the inability of those surrounding them at the time to take the right things from their success that meant England never progressed. It was the corruptive influences of Charles Reep and Charles Hughes on the FA that saw failure after failure and yet England are currently managed by a man who bases his coaching methods off of Hughes’ manual. The saddest thing about the post-66 obsession with 4-4-2 was that it was not even Ramsey’s preferred formation. He wanted to play a three striker 4-3-3 that was used in 1965 against Spain but realised Bobby Charlton was a liability in a midfield three. He decided to play Charlton as a Hungarian style deep lying centre-forward instead and even gave him the number nine shirt. That’s how 4-4-2 was born. Once Charlton retired from international football, Ramsey reverted to 4-3-3.